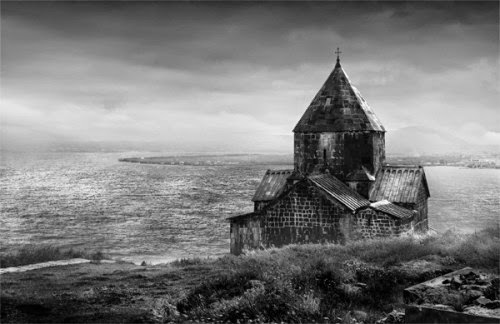 Jean- Michel Berts " Church at lake Sevan"
In an insightful review of Bruce Chatwin's published letters, which appeared in "the Australian" a few years ago, Nicholas Rotwell mischievously compared the British writer to "a kind of internet search engine avant la lettre". He explained : " [Chatwin] was a [ literary ] omnivore and he had a connoisseur's over-fine eye; after all, he had been trained as a teenage prodigy in Sotheby's to spot unnoticed masterpieces. As a result, his taste for obscure books of world import was laser-sharp, and honed further by his youthful travels as a journalist, when he was exposed to a wide range of cultural patterns and perspectives". Earlier, I already mentioned some of these "obscure" authors and books that Chatwin was pointing to and lauded in his letters and short stories. Isaac Babel's "Red Cavalry" for instance or Edmund Wilson with his “ Black Brown Red and Olive”. Gaylord Simpson’s “Attending Marvels”, Peter Mathiessen whose “Far Tortuga” should be preferred to his “Snow leopard”. Ib’n Khaldun’s Muquaddimah, the poems by David Ap Gwilym, Robert Byron's two sacred texts, Osip Mandelstam's "outstanding masterpiece" "Journey to Armenia" and even the Timurid Babur- Nama. Chatwin is unselfishly generous in his praise of others for he sends us back to books which in quite a few cases outclass by far his own works. One forgets Patagonia after reading Oxiana. Who stops at the "Black Hills", when he can journey to Armenia ? Still it is thanks to Bruce Chatwin, that I wish-listed and then purchased the slim blue, cloth - bounded volume of "Journey to Armenia" by Osip Mandelstam. "The superb fresh wind would tear into one's lungs with a whistle. The velocity of the clouds kept increasing by the minute, and the incunabular surf would hasten to issue a fat, hand-printed Gutenberg Bible in half an hour under the gravely scowling sky." Osip Mandelstam's "Journey to Armenia" is unlike any travelbook you may have read. It is unique, it is delightfully captivating, it is poetry in prose. "Yesterday I was reading Firdousi and it seemed to me that a bumblebee was sitting on the book sucking it." "In Persian poetry ambassadorial winds blow out of China bearing gifts. It scoops up longivity with a silver ladle and endows whoever might desire it with a millenia by threes and fives. That is why the rulers of the Djemdjid dynasty are as long lived as parrots"
Osip Emilyevich Mandelstam born in 1891 in Warszaw, Poland, but lived in Russia during and after its revolution and the rise of the Soviet Union. With Anna Ahkmatova, he was one of the foremost members of the Acmeist school of poets. The increased Stalinization, did not make Mandelstam's live any easier. On the contrary, the poet remained a cursed symbol of freedom and refused to adapt to the requierements of the totalitarian state. The frustration, the anger and the fear made Mandelstam lose his poetic voice. He stopped writing in 1926. In 1930, Bukharin, a "friend in high places", managed to obtain permission for the Mandelstam couple for a nine month journey to Armenia . Armenia, was for Mandelstam, what Georgia had been for Pushkin and the older generations. It was sacred ground. It was the true outpost of the Classical and Christian world. There was to be found the land of Colchis, of Argonautic fame as well as Mount Arrarat where Noah's Ark finally run aground. "A childless old couple received us for the night into the bosom of their tent. Our hosts got ready for the bed. An oil wick lit up the tent, making it seem high as a railroad station. The wife took out a coarse army nightshirt and put it on her husband. I felt as shy as if I were in a palace." Mandelstam was several times arrested by Joseph Stalin's government during the repression and in '38, after a stringent poetic attack on the "Man of Steel", finally sentenced to a camp in Siberia. He died of exhaustion, in dreadful conditions at a transit camp near Vladivostok, december 27, 1938. He never even made it to the final destination. "Sleep is easy in nomad camps. The body, exhausted by space, grows warm, stretches out, recalls the length of the road. The paths of the mountain ridges run like shivers along the spine. The velvet meadows burden and tickle the eyelids. Bedsores of the ravine hollow out the sides. Sleep immures you, walls you in. Last thought: have to ride around some ridge."